President Donald Trump speaks in the Rose Garden of the White House in Washington before signing an executive order aimed at easing an IRS rule limiting political activity for churches, May 4, 2017. 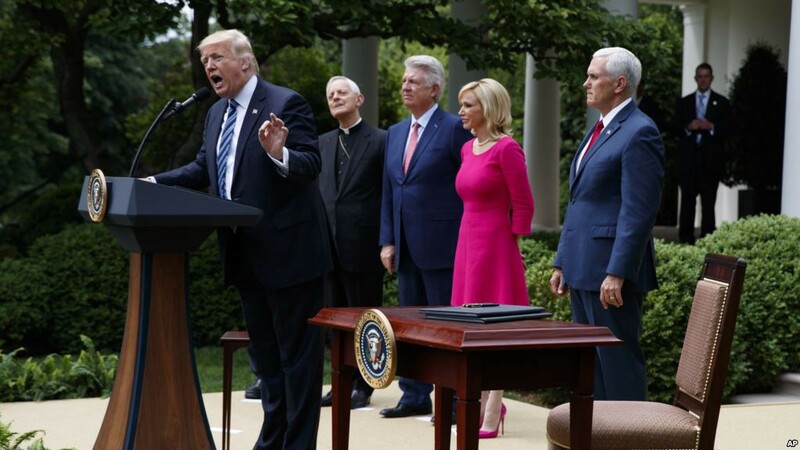 From second from left are Cardinal Donald Wuerl, archbishop of Washington; Pastor Jack Graham; Paula White, senior pastor of New Destiny Christian Center in Apopka, Fla.; and Vice President Mike Pence. As American Baptists who cherish our freedoms, who have been strong advocates of religious liberty since the 17th century, and who played a significant role in establishing the principle of the separation of church and state in the United States, we should be supportive, right? I think not. The executive order of May 4 promotes religious tyranny rather than religious freedom, and we have no business supporting it. Baptists like Roger Williams knew what it was like when only one faction of one faith had the power of the state behind them and were free to persecute those who disagreed. In his day, the government was controlled by the Puritans. Baptists were often imprisoned for their preaching and prosecuted for child abuse for refusing to baptize infants. So it is no surprise that Baptists played a major role in establishing both religious freedom and the separation of church and state as legal principles in our nation. In fact, due to the strong advocacy of the Danbury Street Baptists, Thomas Jefferson was moved to write to them using the phrase “separation between church and state” for the first time. This understanding of the wisdom and benefit of separation led, in time, to the inclusion of the “establishment clause” as part of the first amendment: “Congress shall make no law respecting an establishment of religion.” It is because of the establishment clause that we have the religious freedom for which Baptists fought and continue to cherish. Trump’s order does not uphold this freedom. It threatens it. The Johnson Amendment is not our enemy. It was enacted to protect our freedom by supporting the establishment clause. Endorsing candidates from the pulpit makes churches part of political campaigns. Tax-deductible contributions to our churches then become money in the coffers of our preferred candidates; thus, church and state are no longer separate, and everyone’s religious freedom is threatened. We need to uphold the Johnson Amendment, not undermine it. I agree. If the president gets his way, Christian fundamentalists will be one step closer to controlling the government and establishing a virtual theocracy, not unlike that which the first Baptists in the new world fought so hard to overcome. Therefore, the best way to defend religious freedom today is by opposing this “religious freedom” order. Let us be clear. Trump’s “religious freedom” is not our religious freedom and never will be. The Rev. Dr. Karyn Carlo is a retired New York City police captain who became a preacher, teacher and theologian. She currently serves as a volunteer theological educator with American Baptist International Ministries and as chair of the Public Mission Committee of American Baptist Churches of Metropolitan New York. The views expressed are those of the author and not necessarily those of the American Baptist Home Mission Societies.